Unbelievable day for Lindsay and Mark as they celebrated their Swallows Nest Barn Wedding. We started the day at the Barn as Lindsay and Mark finished their preparations at other locations. However, they both arrived in style. Lindsay in a HUGE limo, which contained her entire bridal party. 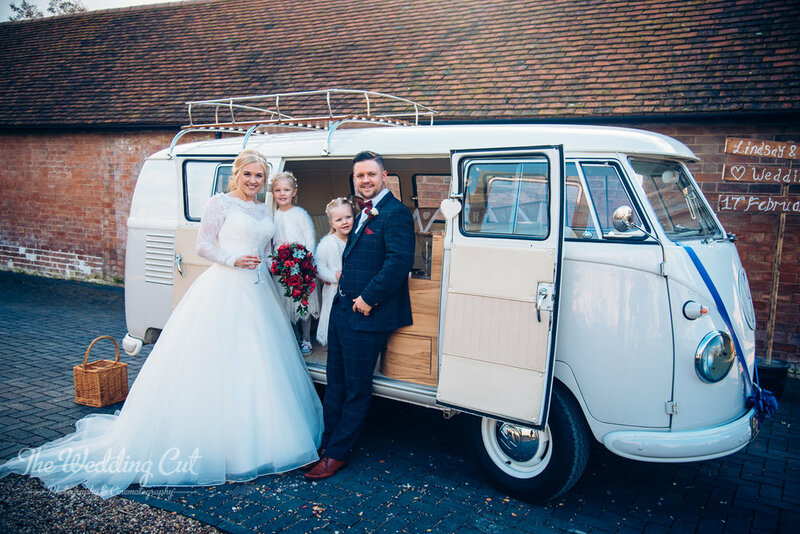 Soon after Mark arrived in a classic VW camper van, and that contained all of his Ushers and best men. Once the guys were in position they were dispatched to add some finishing touches to the decorations. Guests started to arrive and the barn which held the ceremony was beginning to fill up. Lindsay wanted to see her Father before the the ceremony began to reveal her beautiful dress. Tears were shed in a very touching moment between the two. A few minutes later, Mark was looking nervous at the top of the aisle and waiting for his soon-to-be bride. The guests stood to welcome the bridal party. Mark and Lindsay already have two children and their two little girls, Sadie and Ellison came down the aisle first, hand in hand. After they had been seated, the Bridesmaids then walked down the aisle. Lindsay and her Father then entered the Barn, and Lindsay only had eyes for Mark as she was all smiles walking down the aisle. 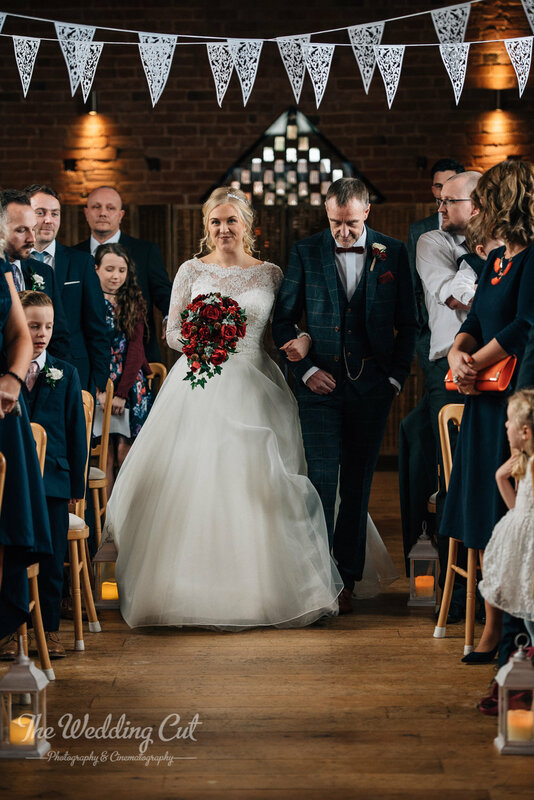 After a few promises, vows and three wonderful readings, one was a surprise from their eldest daughter Sadie, the couple were wed and celebrated with a kiss. After the barn had emptied, we setup the confetti shot and, what a huge amount of confetti there was. Wonderful! We soon went off up the lane to do a few photos with the couple in the campervan in the thicket and down the lane. The sun was perfect for wonderful portrait shots. The couple soon returned and mingled. After a few formal photos we then headed into the wedding breakfast. Complimented by five speeches. The evening was then upon us and the newly-weds welcomed a few evening guests. After the cake cutting (which was made by a friend of theirs), they soon went into their first dance. Again a friend of theirs helps out singing their first dance. A very touching moment for all. We had a wonderful day photographing and filming their wedding day.